Tucked away in boxes at my parents house sit some of the baseball cards I collected while growing up. While 99% of the cards could be worth to a recycling facility than to a collector they all tell a story about my youth. I remember looking at some of the cards and wondering about everything which went into the production of the cards. Gene Wojciechowski recently wrote a column about Gregg Forwerck a photographer for Topps. While it doesn’t get into the details of the photographing process, it is interesting to learn about the photographer, his backgrounds and some of what he has come across in his 19 years of being the “Annie Leibovitz of sports trading card photographers”. Here is an article I found about picture day at Giants spring training in 2006, while it is from two seasons ago it is still interesting to see what happens during photo day. Also for those keeping track, 15 days until opening day for the White Sox. This past Friday evening I headed to Phoenix with a friend I’ve known since I was 10 for the First Friday Art Detour as well as a party he knew of nearby. After crashing at a friend of his house we headed back to Tucson for the Saturday afternoon baseball game. On the drive back we had some time, so Mark suggested stopping at the ostrich farm in the shadows of Picacho Peak. I recall when at the University of Arizona this being added, but I had never stopped. For a $5 fee you can feed the ostriches, emus, lorikeets and a few other animals. Once we feed the ostriches and lorikeets we headed south towards Tucson and the baseball game. 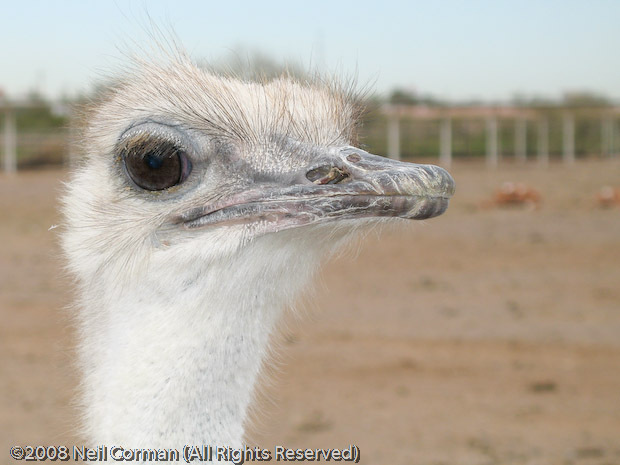 It was an interesting experience, and here are some fun facts about the ostrich. 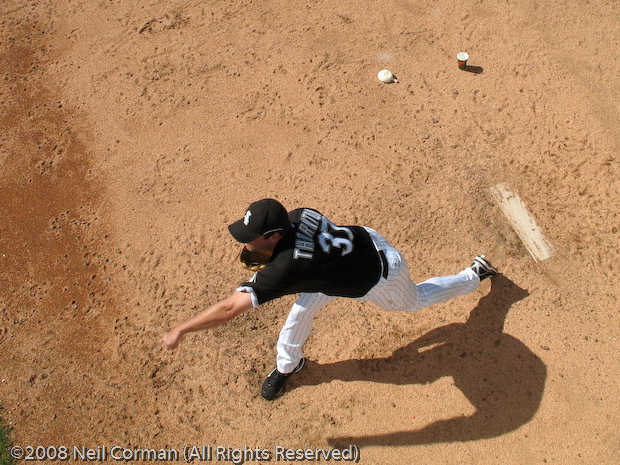 This past weekend I headed to Tucson to watch some spring training games featuring the Chicago White Sox. While on Friday they got crushed by the Arizona Diamondbacks, it was a split squad game featuring mostly players who will not be on the opening day squad. On Saturday it was a better outcome with them winning the game over the San Francisco Giants. The below image is one I took of Matt Thornton warming up in the bullpen, prior to being asked not to lean on the fence as well as place the camera over the fence to obtain additional images of the warm-ups. A few minutes after this image was taken he did enter the to pitch a scoreless inning. With the White Sox wanting to move to Phoenix, there could be only a few years left of spring baseball in Tucson. I recommend checking out a game for one of the three teams in the area if you get the chance. This seems quite reaching and was posted as a warning today on the blog Photo Attorney. Sure it is nice to enter a contest and possibly win, but you should always read the terms to find out just what you are giving up by entering. With that in mind, what do you win? As I mentioned yesterday it was a record high temperature in Denver at 74 degrees. Sunday morning I woke up with the wind howling against my house and upon looking outside snow. While most of the snowfall had ended by the afternoon, I ventured out to Washington Park for a walk around the main loop with my camera. A few people were out jogging in the elements, and I found out the walk back to the north end of the park was a little brutal when the wind would gust. 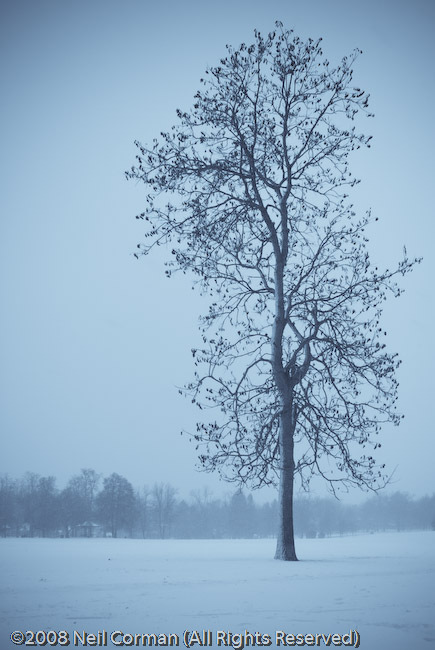 The following image was captured during the afternoon, and I decided to convert it to a style which would tell the story of a snowy Sunday. This month the Society for Photographic Education (SPE) will be holding their 45th annual conference for three days in Denver. To help mark this the local arts community has made March a “Month of Photography in Denver” with many local and national artists showcasing their photographic imagery at various venues. Details regarding the various venues may be found at the Month of Photography site. Record high 74 degrees Fahrenheit today in Denver, Colorado. Tomorrow… 35 degrees cooler and snow. Felt good to be out enjoying the nice weather. It’s leap day and the following sums it up nicely. I am sure there are many of you who started accessing the internet with Netscape Navigator which owned the majority of market-share in the mid-1990’s. I still recall using it on my Macintosh (and later a PC) with dial-up access, not the quickest option but with less embedded media in webpages it did suffice. Netscape was not the first browser I used, those were the text based Lynx and Mosiac in some of the computer labs at the University of Arizona. Over the years other options sprung up and soon Internet Explorer started taking market share from Netscape until passing it in the late 90’s with a better product. Netscape was bought by AOL and the downfall of the browser continued, finally leading to the demise of it as of March 1, 2008 when support will no longer be provided for Netscape Navigator. Right now as you read this post, I would guess you are using one of three browsers: Internet Explorer, Safari or Firefox. The majority of users do use Internet Explorer, however Firefox is continuing to grow in usage with now 15% of internet users. This is significant for the browser wars as one which competes directly with IE forces innovations to be developed resulting in the users of the product benefiting, which is something we didn’t have for a while. It should be noted the underlying basis of Firefox is based on technology from the Mozilla Corporation which came from the Mozilla Foundation and before that the Mozilla Organization created by Netscape. So while Netscape Navigator is no longer an option when viewing the web, Firefox continues to grow and who knows someday we could be reading a post like this regarding Internet Explorer… you may laugh but anything is possible. If you haven’t given Firefox a try you can find more information by clicking below. If you are returning you may have noticed a different look to the blog from the last time you stopped by to check out the latest postings. For those of you making their first visit welcome, and I hope to see you visiting regularly. The blog was due a change from the default style used previously. One, of the things you may have noticed is a wider area where the entries are posted. This additional area allows images to be posted in a larger size than in the previous version of the blog. However the main reason for the change is to integrate the blog into the format of the website which is scheduled to be completed in a few weeks. If you would like to receive notification when the new site is complete, I recommend signing up for the Neil Corman Photography e-mail list. This will provide you with news, updates and exclusive specials directly to your inbox. The information collected is not provided to any external entities and is only used to provide updates regarding Neil Corman Photography. If you would like to register you may do so here.